War is terrible. It wreaks terrible devastation on men, but of far greater magnitude is the devastation wrought on men in peace times, especially in the developed nations. There are no biological factors that make men die sooner than women in the developed nations. Even in most underdeveloped or lesser developed nations there are very few (about half a dozen) whose life expectancies for men are higher than or equal to those of women. Nevertheless, developed nations have the greatest disparity in life expectancies of the sexes. The superior technological sociological advances and advantages enjoyed in the developed nations benefit predominantly women and not to the same extent men. Men do the dirty, dangerous and deadly jobs in war as in peace. 4.4 million men and boys in the world lost their lives in 1997 due to anti-male discrimination. In the whole world, every seven seconds one male human life is being sacrificed on account of feminism (anti-male discrimination, that is). As Napoleon, the pig, said in George Orwell's Animal Farm: "All animals are equal, but some animals are more equal than others." Most men would not mind it so much to see Chivalry continue, if only men were to continue to receive credit for the fact that women were and are more equal than men, only more so now, now that feminism came to power and brings its full force to bear in the oppression of men, without men receiving the credit that is due to them. Now, males do not just have the dubious privilege of being murdered by our governments for profit  they must have their children removed, be purged of the wealth they have created and their property confiscated as a matter of course. Soon no doubt, they will be shaved so that their body hair can be used to stuff mattresses and their dental filings removed for scrap metal. One who became seriously ill and died. One who died from shrapnel wounds. She was posthumously awarded the Vietnamese Gallantry Cross with Palm and the Bronze Star for Heroism. A bronze statue was erected at the nursing school she had attended, and the names of 110 local servicemen from her community that were killed in Vietnam are on the base of the statue. One suffered a stroke and died four days later in Japan. "Equality" isn't enough for the feminists. It was not enough to have those eight women's names included amongst the more than 58,000 names of their brothers in arms listed on the Black Wall. "Boys with boys and girls with girls!" I can't help but wonder. Were the same standards that were used to determine whether women qualified for inclusion in a Vietnam War Memorial of their segregated-own applied also to all of the men that gave their lives in the service of their country? Historians seem reluctant to record or publish the names and numbers of American women who gave their lives in service to their country. Whether from illness, injury, disease, enemy fire, plane crashes, or the unknown, they deserve to be remembered as having made the ultimate sacrifice. Let us all remember that women have served proudly since our nation began. Historians seem reluctant to give attention to women's military service? Wouldn't that be a result of the great disparity in the numbers of men and women serving in theaters of war? The men that served in Vietnam numbered 2.59 million, as compared to less than 10,000 women who did, a ratio of 259 men for every woman. No extent of re-writing history can change the facts, unless numbers are changed as well. Didn't the men serve proudly, too? About two-thirds of them were volunteers. Going by those numbers, with respect to the Vietnam War men were 259 times more likely than women to proudly serve their nation through military action, but those women who mounted the courage to come close to the "field of glory" were far less likely than men to come to any harm. 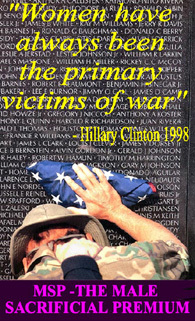 One woman out of every 1250, and one man out of every 44 got killed in Vietnam. Perhaps women never managed to come quite close enough, not as close as the men did. Nevertheless, American women were not satisfied with having their eight fallen sisters included in the memorial for their country's heroes. They wanted and received a memorial of their own. One out of every 10 American[ men] who served in Vietnam was a casualty. 58,169 were killed and 304,000 wounded out of 2.59 million who served. Although the percent who died is similar to other wars, amputations or crippling wounds were 300 percent higher than in World War II. 75,000 Vietnam veterans are severely disabled. 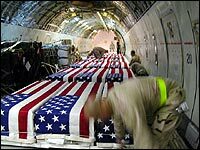 The flag-draped coffins of 21 soldiers killed in Iraq are carefully strapped down and checked before being returned to the United States aboard a military transport plane. The irony, of course, is that the about 700 US soldiers that lost their lives so far in that war is not news, but that when a woman photographer loses her job on account of reporting on that calamity, that makes the headlines. We are not even allowed to know that men are being made to die, but we are made to feel sorry for a woman losing her job for telling the truth. That is part of the price of the male sacrificial premium. See also US casualty list for Iraq. As of 2004 04 24, 719 dead in Iraq, 17 of them (one out of every 42) women. At that rate, it'll be quite a while before women try hard enough to become fully equal to men. ...[US Veteran Affairs] estimates that 107,000 veterans are homeless on any given night. Over the course of a year, approximately twice that many experience homelessness. Only eight percent of the general population can claim veteran status, but nearly one-fifth of the homeless population are veterans. Veterans in both state and federal prison were almost exclusively male (99 percent). There were an estimated 140,000 veterans held in state and federal prisons. State prisons held 127,500 of these veterans, and federal prisons held 12,500. Although incarcerated veterans are not considered to be homeless, be sure to contemplate those and many more facts like them at their source before considering, or encouraging your son, to join the Armed Forces.